Brand new donut shop in my hood? I'll be there, of course! I've never heard of Duck Donuts before, but the concept sounded fun. As you walk in, in case you don't know how this works, they have a sign to tell you the low down. 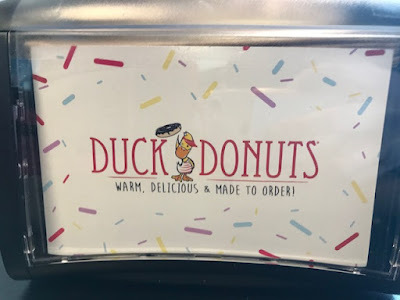 Basically it's donut made to order. 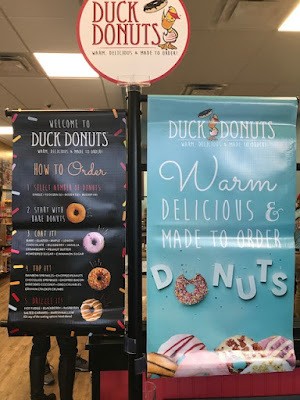 They have yummy cake donuts (my favorite), you pick a coating: bare, cinnamon sugar, powder sugar, glaze, chocolate icing, vanilla, strawberry, blueberry, peanut butter, maple, and lemon. Then, you have your toppings: Rainbow Sprinkles, Chocolate Sprinkles, Graham Cracker crumbs, Oregon crumbs, chopped peanuts, bacon pieces, shredded coconuts. Lastly you have drizzle: chocolate, marshmallow, salted caramel, raspberry, blackberry. Sometimes, the made-to-order can come up with some pretty awesome combo. But, I also can be my own worst enemy and come up with some horrific combos. Lest we forget the horrific ice cream combo? If coming up with your combo is too much pressure, they have pre-tested combos in the Classics collections, Winter selections (which is seasonal), and some Fan Favorites. Each set have about 12 to choose from, and either those will inspire you or you can make your own combo. So, what did we get? 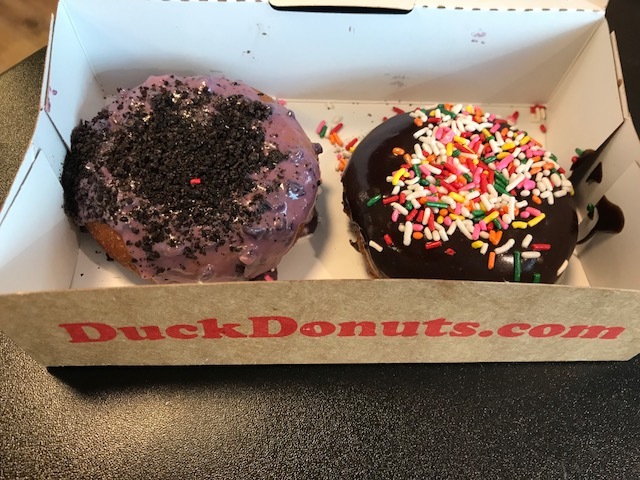 Left is my combo of blueberry coating with Oreo crumbs. The right one is the class chocolate coating with Rainbow Sprinkles. How does it fair? Well, the donuts are warm because it literally just came off the frying belt. Their stuff take your order ticket and make them per your request. They even have windows for you to watch your donuts being made. 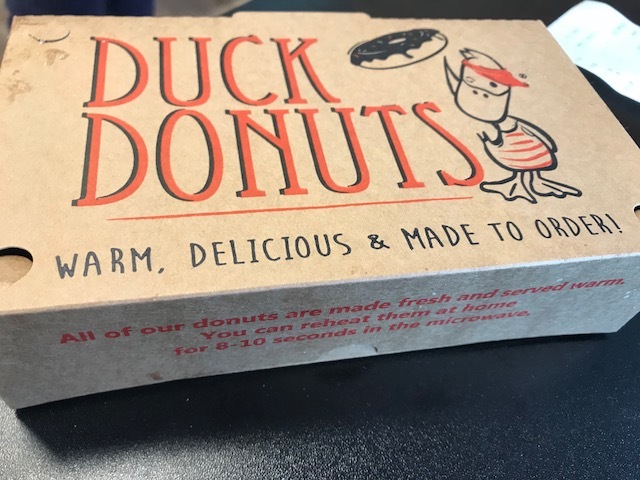 The thing about it is that I'm not used to it all still being so warm, so the coating hasn't set and the donuts isn't cooled, so needless to say I made a mess all over the place. Strangely enough, it wasn't the Oreo crumbs that caught me it was the blueberry coating. I think next time I will get a cup of coffee to go with them. I saw that they also have sundae and breakfast sandwiches. So, that's definitely something to try as well.